Stars & Stripes mens suit & tie. The USA is known for being the land of endless opportunities. 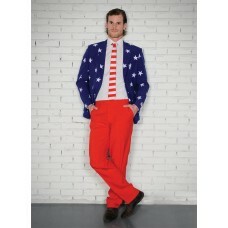 That is why we have decided to create a stylish suit based on the characteristic stars and stripes. For great use at all kinds of sporting events, independence day, rodeo shows, presidential elections and so on. Stars and Stripes consists of a blue jacket with white stars, red pants and a white-red striped tie.